The Franke Model EC Combination bedpan and wash-up sluice sink is manufactured from grade 304 (18/10 stainless steel with a thickness of 1.6mm. The draining board and bowls are 1, 2 mm thick. 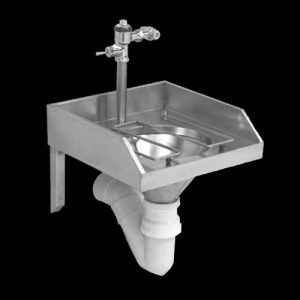 The combination bedpan and wash-up sink unit comes with a 150 mm high integral splash back to the rear and 15 mm deep hospital beading on the top surface. There is a 100 mm apron to front and sides. 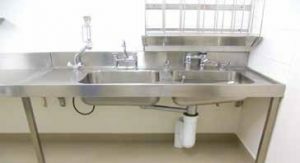 The hospital sink unit is fitted with two pressed seamless bowls with the sluice bowl having an integral flushing rim and a 38 mm diameter inlet pipe for the flush valve. The flush valve is included and cannot be ordered separately. 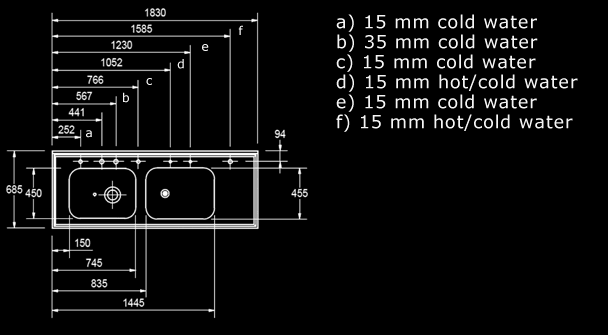 The waste outlet on the sluice bowl is 110 mm and the rinse bowl size is 610 x 460 x 230 mm deep with a 40 mm waste outlet. 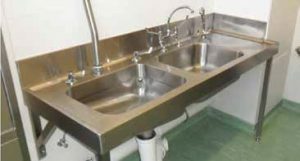 The underside of the combination bedpan and wash-up sink is sprayed with vermin proof bitumastic sound deadening compound and has a galvanized mild steel backing sheet. 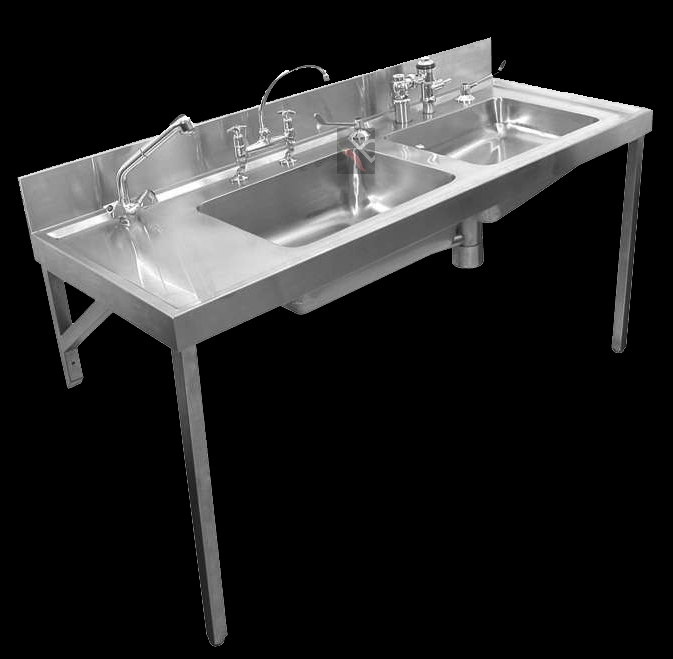 The EC Combination bedpan and wash-up sluice sink is supplied complete with a factory fitted Cobra FM 1.00 flush valve, 35 mm water supply through 50 mm sleeve on unit, P171/041 pillar mixer with over- arm swivel spout, CP297 pillar mixer with retractable hand spray, 15 mm bedpan spray nozzle, 15 mm bottle spray nozzle (both nozzles activated by two 15 mm quarter turn elbow action valves). Please refer to fixing table below for fixing options. Unit is plumbed at factory and is supplied complete with fittings. NOTE: you cannot add your own flushing fittings as it is factory fitted. 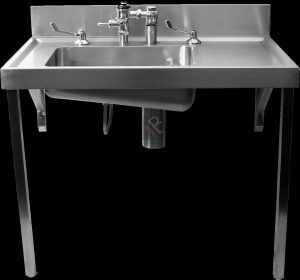 This unit supplied complete with a 11 liters stainless steel high level cistern fitted with a Supa Flush Valve and pull chain, 41 mm diameter stainless steel flush pipe and 41 chrome plated coupling which is reduced on one end to fit the 38 mm connection. Unit is plumbed at factory and is supplied complete with fittings. 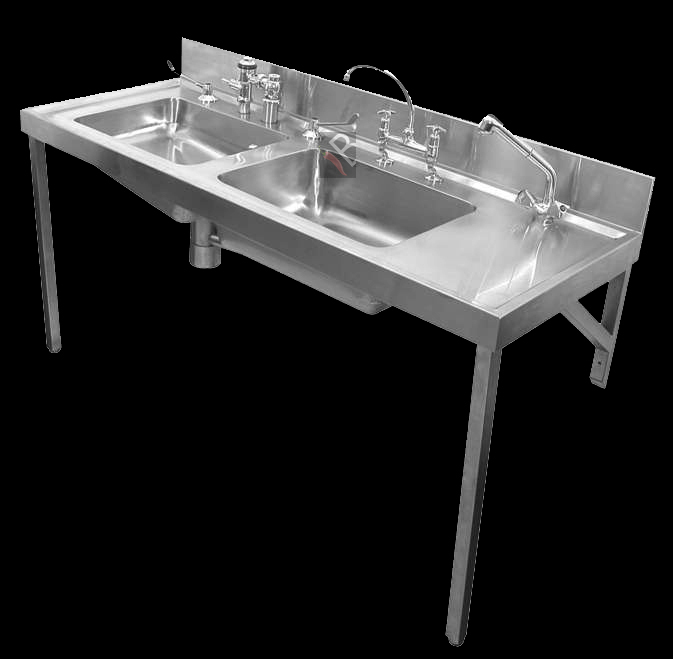 Combination bedpan washup sluice sink with flush valve. Top view of the EC Combination bedpan and sluice sink. 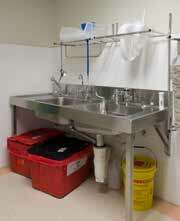 Combination bedpan and Sluice sink combo with right hand bowls and flush valve. Above right is the bedpan bottle rack BR6. Sluice sink combo EC6 right hand with flush valve complete. 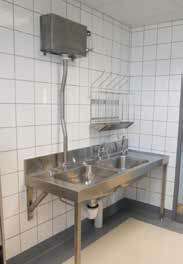 Sluice bedpan sink combo with high level cistern. Bepdan Sluice sink combo 1850 mm with added stainless steel splash back to the right. Stainless Steel Round legs: Round Legs manufactured from grade 304(18/10) stainless steel 41 mm diameter x 1,2 mm thick round tubing. Legs to be detachable and fitted with chrome plated adjustable flanged foot pieces. Stainless Steel Square legs: Square Legs manufactured from grade 304(18/10) stainless steel 40 x 40 mm x 1,2 mm thick square tubing. Legs to be detachable and fitted with chrome plated adjustable flanged foot pieces. Stainless Steel Gallows Brackets with Front Leg: Gallows Brackets with Front Legs manufactured from grade 304(18/10) stainless steel 40 x 40 mm x 1,2 mm thick square tubing. The front leg is detachable and is fitted with chrome plated adjustable flanged foot pieces. Stainless Steel Cantilever Brackets: Cantilever Brackets are manufactured from grade 304(18/10) stainless steel, 40 x 40 mm and 1,2 mm thick square tubing. *These brackets are used in areas where the floors have covered skirting and the design makes cleaning under the unit very easy.